Happeh annibirfary week, peeps! Ebreewun deserbs a big cheer an a cookie – we did nawt let teh awsumist community in teh whirld die coz uv stoopy greedy commershalisms, we surviveded! (Histry heer, if yu arribed layt or need a reminder!) Cheezland am nawt about the admins an mods. Cheezland am about the peeps making lols and sending in pics, an about teh commenters, an teh lurkers, an teh peeps whu donayted munnies, an, well, EBREEWUN. 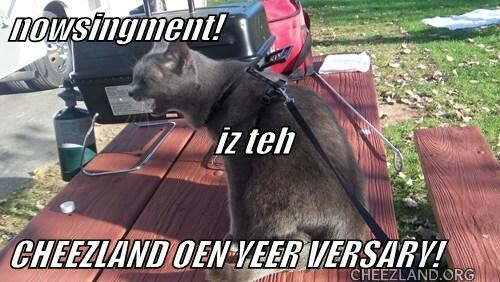 If yu am reeding this, know that yu am a part uv why Cheezland am still here!!! An doan’t u fergit it! Concatyoolayshuz awn ur nawt sekkund! Happee Annipussary! Thx, JK! Ai awlmoast feal liek it iz mai speshul sillibrayshun as it iz an ANNIbersaree! Happeee Anni Beersury Ebbery oen! Yesh! Happity birfday to us! Fanks to prysma adn seanya adn ebrywun hoo mayd it happen! hears two habin fun fore a hole yeer! Otay, folks, on teh last lol I started tu playcing an order fur stuffs we gonna need fur teh beech / pool sillybrayshuns! What all duz we needing? (Iz tuu erly in teh moarning here tu fink cleerly, I gonna furget importint stuffs! Feel free tu back up rite tu A!!!) Will send in teh order an get tehm tu send teh bigbigbig trucks tu deliber it awl!!! Duckies, rubber, foar teh pool. Very colorful Hayan lais, made ob fevvers? Zebra — to ride inna da surf! *whisspurrs* mi 2 Maryqos! Ob korse, wen yu r mi siiz ebbery1 lukks tall! Fang Q for teh histry linkee, Prysma. Ai kinda wundered how Cheezland caem abowt. Ai founded it bai axident – Ai iz mostly a lurker, and dont follow awl teh commints ebbryday. And ai is SO berry happee to be heer. ICHC wuz nebber teh saym wunce teh commints and community were gawn. *rushlez over 2 hippo* ohai gnu frend! extenz floofy pawz ob frenchchipz. eye iz hippo 2 meetch ya. Ai c taht Serena haz got teh cheezburger masheen owt in reddiness tu ! Happi annibirfary week ebberybunny ! Wi noe kneads da pleh sun blok loshun inna Cheezland sun shynne duz wi? Noe badbadbad sunirays heer rite? Yahhhhoooo! Dis littlol kitteh haz a berryberry beeg happitalol!!1! Ai kin fyn ally kom awot ob da dawk shades anna dansdansdans inna da sunny shynnes! Ai lubslubslubs Cheezland! an teh fuds no gots no pleh kaleries! Happy annipussary to da cheezland community, and many more! Ohai TomSpud! *extends floofy paw uv french chips* Idon’t finso wii haz metted b4! I iz so glad tu meeting u! I post seldomly, but lurk every day! *runz inna cicale, getz da dizzinezz, sitz dawn* anudder gnu frend! *extendz mai floofy paw ob frenchps* eye iz pleezed 2 meetya! Ohai Tomspud!!! Iz bery nyse tew meetchew *extens floofy paw ov frenships* Wii hazzint offishully met. In Cheezland, the time is 05:20.